Processing returns is a hassle for any business. Signing for packages, determining the reason for the return, inspecting the goods - it takes a lot of time. Shipvine makes returns processing simple. Each month we process thousands of returns which arrive by USPS, UPS, DHL and FedEx. Returns can include rejected/refused packages, customer exchanges, and just plain old returns. When we receive your returns you’re notified right away via email or from logging into our cloud-based Logistics platform. Typically items are processed within 48-72 hours. Items that require refurbishment or repacking average 7-10 days to be returned to inventory. We'll use a judgment call based on your business whether a product is defective and can't be returned to inventory. Those items can be destroyed or returned to you. Any notes/requests your customers add to the return will be noted so you can provide a refund, store credit or place an exchange order. 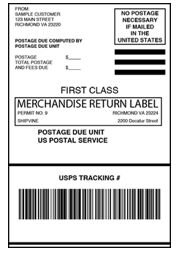 Reduce return shipping cost and increase customer satisfaction by using the USPS Merchandise Returns Label. You only pay for postage if the label is used. For lighter items, you’ll see significant savings over UPS or FedEx return shipping. This labels can be included in each order making returns convenient. Plus you'll be able to track the return before it even arrives at our facility. You can choose which method your customer will make their returns based on your business rules. We support return labels from UPS, FedEx, and the USPS. This gives you the option to have insurance, more reliable tracking, and day definite guarantee when you need it. 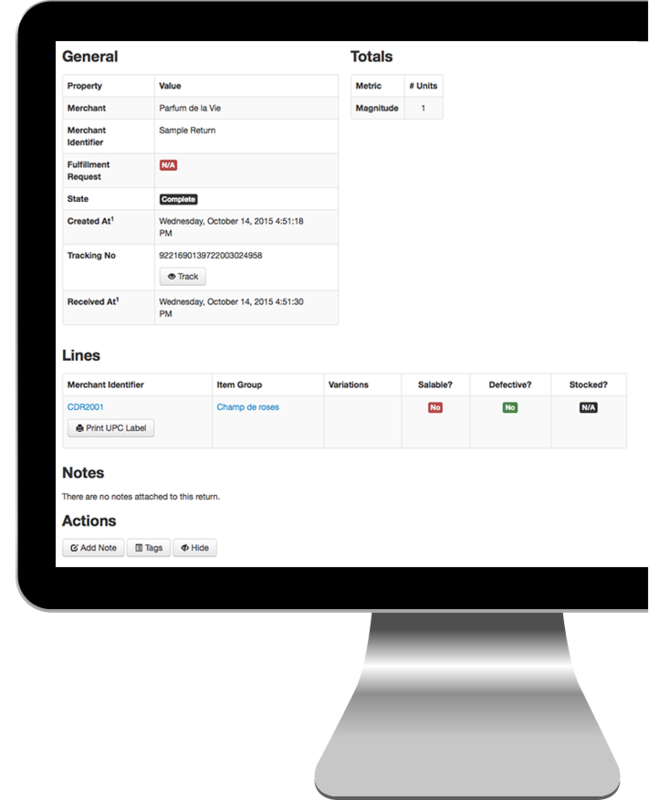 Our API provides easy access for sharing customer return data between our system and yours. The returns API access also gives you a simple way to request a PDF return label for FedEx, UPS or USPS in one quick and easy step. This PDF label can then be sent to your customer via email or displayed on your website for download. Best of all our rest-based API is included free of charge with your account, so there are no extra fees for accessing your data. Any programmer with XML and API knowledge can easily integrate your website or back-end system with the Shipvine API. You choose the return services that fit your business needs. USPS return label will be included for $.10/label. $.50/label for FedEx or UPS. You can also allow your customers to download & print for free. Each product returned by your customer is just $1.00. For example, a 2 unit order returned would cost just $2.00 for return processing. No charge for general repacking. Items requiring refurbishment are charged a general labor rate for time. For USPS labels you're charged the return postage. If you shipped the item out using USPS it would be the same price to ship it back. FedEx and UPS are charged the current rate plus $.50 return for handling.